LOCATION.--Lat 40°55'02", long 74°39'56" referenced to North American Datum of 1983, Roxbury Township, Morris County, NJ, Hydrologic Unit 02040105, on left bank just upstream of highway bridge on Lakeside Boulevard (County Route 607), 300 ft downstream from Lake Hopatcong Dam in Landing. PERIOD OF RECORD.--Continuous-record gaging station, July 1928 to September 1975, April 2002 to current year. Annual maximum, water years 1976 to 1995, 2000. REVISED RECORDS.--WSP 781:1928(M). WSP 1051:1944-1945. WDR NJ-78-2: 1976(M). WDR NJ-82-2: Drainage area. WDR NJ-04-1:2000(M). 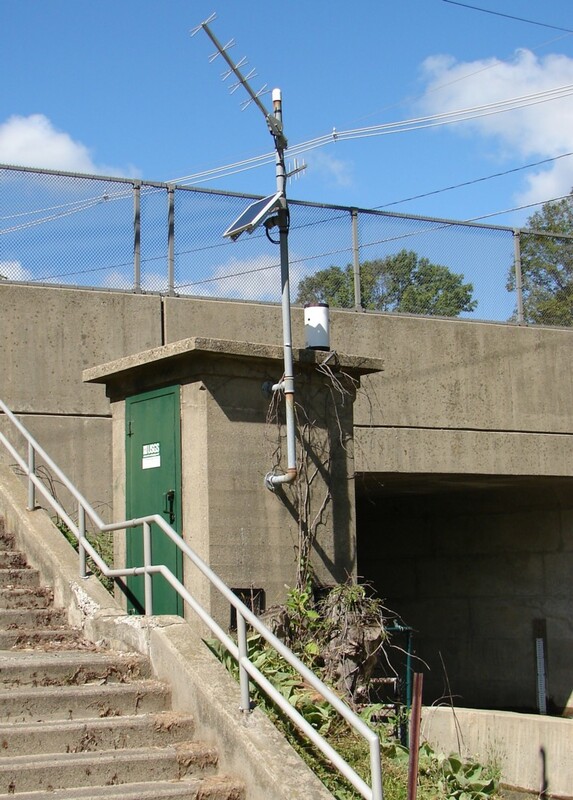 GAGE.--Water-stage and precipitation recorder with telemetry and concrete control. Prior to August 24, 1967, concrete control at site 40 ft downstream. Datum of gage is 904.99 ft above NGVD of 1929 (New Jersey Geological Survey benchmark). REMARKS.--Records fair, except for estimated discharges, which are poor. Flow regulated by Lake Hopatcong (see 01455400). EXTREMES FOR PERIOD OF RECORD.--Maximum discharge, 1,900 ft3/s, on basis of flow over dam computation of peak flow, Aug 13, 2000, gage height, 10.74 ft, from high-water mark in gage house; minimum discharge, 0.0 ft3/s, Jan 1, 1900. Lake level data for Lake Hopatcong are available at this link.